Laser word comes from “Light Amplification of Stimulated Emission of Radiation”. Normal light is the combination of all colors of light and it is white. But laser takes its color according to the wavelenght that it is formed and it is one-colored (monochromatic). All the photons forming laser are at the same wavelength and in tyhe form of parallel waves. Laser light can reach long distances without losing this form. As its photon density is higher, laser light is brighter than sunlight. 1. High Level Lasers: Used for cutting tissues, coagulating the blood, burning infected tissues or vaporization. 2. Low Level Lasers (Soft Lasers): Used for stimulating the operation of the cells and tissues. The most used colors of laser are Red and Infra-red. There are medical devices manufactured for this purpose. LLLT or Soft laser treatment aims to activate the healing mechanism at cells and tissues by sending a certain dosage of beam with high density at one wavelength (monochromatic) and same frequency (photons that carries the energy of the light will be at the same phase) to the target area. This treatment aims to support the healing of wounds and every kind of cell and soft tissue damages and reducing the acute and chronic pains by applying red and infra-red wavelength beams to the damaged or infected tissues. LLLT, when applied to accurate indications by trained specialists, has no harmful effects and does not require medication. LLLT is also a painless and non-invasive (no pricking and cutting operation is needed) treatment which is a highly safe and effective method. LLLT decreases the healing time up to a rate of %30-40 and the tissues that have been cured by laser applications are more healthy and strong compared to the tissues that healed without a laser application. How the laser beam effects cells? Unlike surgical lasers, the laser beams used during LLLT do not form heat and do not cause any damages to the tissues. The reactions between molecules, macromolecules and cells are basically electromagnetic and controlled by the small particles called photons. For this reason, electromagnetic formations like laser light creates important effects on cells when applied with appropriate wavelenghts. This impact is a photochemical one and can be compared to photosynthesis of plants. Red Light causes better functioning of the cells by increasing the ATP (Adenosine triphosphate) production which is the energy source of the cells and so the cells can participate more effectively in tissue healing process. The researches showed that the cells that cleans up damaged, dead cells and leftovers (phagocytosis-making cells) emits beams at a variety of wavelenghts. It is also being showed that many cells like lymphocyte, leukocyte, makrofaj, fibroblast are being stimulated by low level laser beams at this wavelength. Living cells have to do the function called metabolism to perpetuate their liveliness. And during metabolism process energy is consumed and heat is formed. Correctly applied laser radiation at appropriate levels makes important effects on the activities of the living systems. According to the treatment period, it can last between seconds to minutes. Response to treatment is showed to be dependent on the dosage applied. For this reason, frequent treatments wit low dosage can be more effective compared to one time treatments with high level. 1. Causes the tissues and cells to be fed with more oxygen and consequently speeds up the healing process of damaged parts by increasing the circulation speed. 2. Activates the collagen excreting cells that are called fibroblasts. Fibroblasts plays an important role at tissue healing process and provides tissue elasticity. So by increasing their production, LLLT enhances the tissue and cell healing process. 3. Increases the ATP production at the cells. ATP provides energy storage and transmission and plays a vital role in disposing leftovers and normal functioning of the cells. 4. Helps the recovery of edemas at the tissues by activating the lymphatic system. 5. Reduces the healing time of the infected and damaged cells or get them replaced with new ones by increasing the RNA and DNA production. RNA and DNA are needed for reproduction, regeneration and normal functioning. 6. Particles carrying the energy of light (photons) enters the tissues and cells as negatively charged ions. This interaction causes thje positivelyu charged ions like calcium to flow through the healing areas at the body. This process also decreases the pain feeling by effecting the nerves that carry pain sense. 7. Craetes photo-chemical reactions which increases the temperature at the cell. This increase at the temperature activates the function which detects the damaged cells and disposes them and called phagocytosis. This step is the most important one at the beginning stages of the infections which effects the success rate. 8. Decreases the pain level by increasing the endorphine and encephaline levels at the brain. 9. Ease and relaxes the muscles. The penetration of Low Level Laser into the tissues depends on the wavelength. Red Light can enter 2-3 mm deep. Depending on its wavelength, infra-red lasers can go 4-5 cm. deep. The ttype of the tissue, way of application and the output power of the laser are also effective on the penetration depth of the laser. The laser selection for LLLT is made according to the type and place of the ilness to be treated. If an infection on mucosa or skin is to be treated then red light laser should be chosen. Therefore, red light should be preferred for mouth infections, herpes, shingles (herpes zonter), acne, skin infections, venous ulcer, neuralgia, eczama, teeth or gingiva problems, etc. But for the conditions like rinitis, catarrh, allergic rhinitis, infections at the nose, outer and m,iddle ear infections, acute and chronic quinsies, a combination of red and infra-red laser can be preferred. For the ilnesses at muscles and tendons, inner ear (tinnitus, vertigo, hearing loss, etc), jawbone, sinusitis, within the skull and related with bones, infra-red lasers should be chosen for treatment because of their high penetration characteristics. *The effect of LLLT on cochlea and on the cochlea cells which causes the decrease or healing of tinnitus have been studied by many clinical researches since 1989. Major studies are; Dr.Witt, Dr.Path, Dr.Shiomi, Dr.Hahn, Dr.Prochzka, Dr.Swoboda, Dr.von Wedel, Prof. Dr.Marti, Dr.Tauber ve Dr.Fain. Medical Quant’s devices are based on the same technology, and are comprised of a low-level laser diode, infrared and red light LED’s, and a static magnet. 1. Tinnitus Treatment System should be applied to patients in a total of 12 sessions. Each session takes 30 minutes. 2. In the first week there are 3 sessions, and for the remaining weeks there should be one session for each week. Treatment process takes 2 to 2,5 months. 3. During the sessions, Laser and Electromagnetic Waves are applied simultaneously. 4. If the patient has Tinnitus problem in both ears, Laser and Electromagnetic Waves should be applied 15 minutes for each ear after changing the tip of the equipment. 5. Laser beam is applied directly upon the enterance of the air canal as shown in the diagram above. 6. 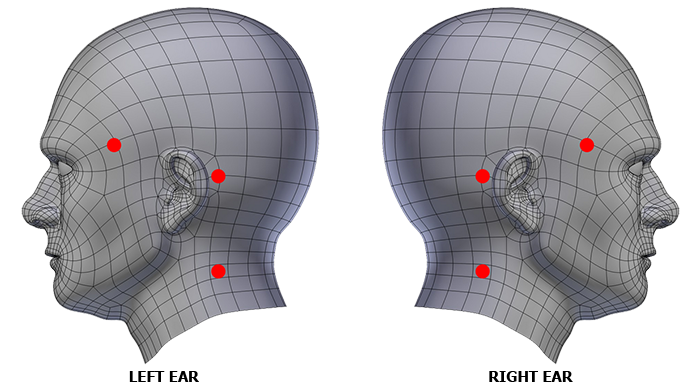 Electromagnetic waves are applied to three different areas on the skull as shown in the diagram below. 1. What is the working principle Odiomed tinnitus System? Odiomed Tinnitus System special thanks to you also COCHLEA of laser light on the (snail in the ear) by stimulating the nerve endings located on the cells and helps hair regeneration of damaged cells and nerve endings. In addition, the muscles of the skull Electrical magnetic waves, pinched nerve neck and helps the treatment of tinnitus, caused by flattening. Tinnitus in clinical tests conducted with the pan every 100 patients were able to get positive results from approximately 70 in. 1168 patients (46%) indicated the disappearance of tinnitus disturbance. 356 patients (14%) indicated that decreased levels of tinnitus discomfort can be easily overlooked. 229 patients (9%) down to the level of tinnitus discomfort that can continue to be problems in daily life, but they continued to live in a quiet environment, he said. 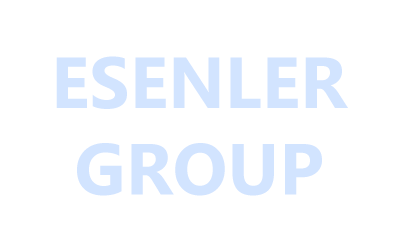 787 patients (31%) indicated that there was no change in the condition. 3. Laser and electromagnetic brain waves give any harm? The laser beam COCHLEA region (snails in the ear) can not get anywhere else outside, and certainly does not hurt because the brain. 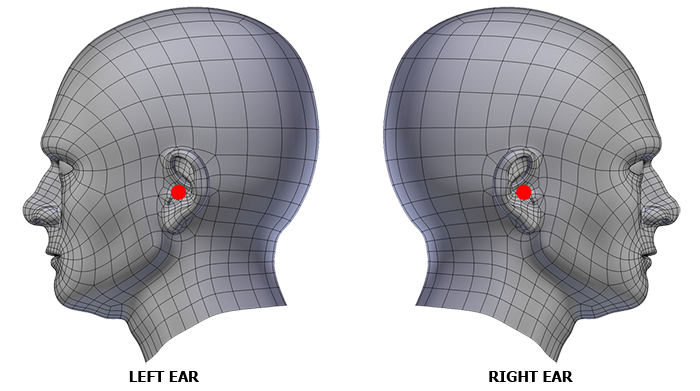 Electromagnetic waves allows the relaxation of the region by sending signals to the small skull. Also Odiomed Tinnitus System dose of light used and the frequency of electromagnetic waves human health is certainly produced in the way that will not harm.